Not to be confused with PortAventura Park. PortAventura World is an entertainment resort in Salou and Vila-seca, Tarragona, on the Costa Daurada in Catalonia, Spain. It was built around the PortAventura Park theme park, which attracts around 3.5 million visitors per year, making it the most visited theme park in Spain and the sixth most visited theme park in Europe. The resort includes a second theme park, Ferrari Land, since 2017 and also includes PortAventura Caribe Aquatic Park, five hotels, a convention centre and a RV park. It is the biggest resort in the south of Europe which attracts around 5 million visitors per year. It has Reus Airport within 15 minutes of it and Barcelona Airport within an hour. There is a train station for PortAventura which has connections to Barcelona, Salou and Tortosa. 'Port Aventura' opened in 1995 in Salou, Tussauds Group had a 40,01% in the park while La Caixa had 33,19%, Anheuser-Busch had 19,9% and FECSA had 6,7%. In 1998 the majority of Tussauds Group'shares in the park were sold to Universal and the park was rebranded as 'Universal's Port Aventura', which made it the first Universal Studios Theme Park in Europe. In 2002, a water park (Costa Caribe) and two hotels (Hotel PortAventura and Hotel El Paso) were constructed, and the resort was further rebranded as 'Universal Mediterranea'. In 2004, NBCUniversal (Universal Studios' parent) sold all interest in PortAventura. It is owned and operated by La Caixa banking group's investment vehicle Criteria, but as of 2005 the Universal name has been dropped from the branding, and the resort was once again named 'PortAventura' (the space in the name is deliberately left out for trademark reasons). In 2009, the resort hosted 3,310,000 visitors. In December 2013 KKR  picks up 49.9% stake in PortAventura from Investindustrial that still owns 50.1%. In 2016 the resort was renamed as 'PortAventura World Parks & Resort'. The second theme park, Ferrari Land, was inaugurated on 7 April 2017. The park features five theme areas based on civilizations (Mediterrània, Far West, México, China and Polynesia), and one theme area based on Sesame Street. Mediterrània is the main entrance area of the park. Furius Baco, an Intamin Accelerator Coaster with winged seating, which opened in June 2007. It has a top speed of 83.9 mph (135 km/h). Stampida, a dueling wooden roller coaster. Tomahawk, a junior version of Stampida and which runs parallel to it. Silver River Flume, a traditional log flume. Grand Canyon Rapids, a whitewater river rapids ride along the Grand Canyon. Hurakan Condor, an Intamin drop tower ride. This ride is one of the tallest in the world at 330 ft.
El Diablo - Tren de la Mina, an Arrow Dynamics mine train roller coaster. The top speed of the coaster is around 60 km/h. Dragon Khan, with 8 inversions this formerly held the record as having more inversions than any other roller coaster. It also held the world record for the tallest vertical loop on any roller-coaster. The ride built by Bolliger & Mabillard was one of the two roller coasters that Port Aventura had when it opened. It consistently ranks among one of the world's best roller coasters in polls. Shambhala, this B&M hypercoaster beat three European records as it was the fastest (134 km/h) and tallest roller coaster in Europe. It is 76 m tall and had longest drop in Europe at 78 m (2 m underground). Angkor, a large splash battle themed in the Angkor ruins that opened in 2014. Tutuki Splash, a Shoot the Chute themed along an erupting volcano. Tami Tami, a roller coaster for children. Street Mission, an interactive Sesame Street dark ride. InvestIndustrial and Ferrari signed a deal to build a new area themed to the Italian sports car brand in the PortAventura resort covering 75,000 m2, including new rides, a 250-room hotel with restaurants, shops and car racing simulators. Ferrari Land is the resort's second theme park, separate from PortAventura Park. Its entrance is adjacent to PortAventura Park's main entrance. The Mediterranean theme is common to both entrances, as Ferrari Land is inspired by Italy, including recreations of Venice's Piazza San Marco and Rome's Colosseum. The main ride of Ferrari Land is a 112 m tall vertical accelerator coaster that surpassed Shambhala as the tallest coaster in Europe and is also the fastest coaster in Europe. The park was opened on 7 April 2017, after an investment of more than €100 million. Ferrari Land opened a kids area in 2018. Ferrari Land is the second amusement centre themed to Ferrari in the world, after Ferrari World Abu Dhabi. Costa Caribe Aquatic Park – La Laguna de Woody. PortAventura Caribe Aquatic Park is a water park which is adjacent to PortAventura Park. It has an area of 50,000 m2, which includes 16 attractions and slides, as well as over 8,500 m2 of water-covered surface area. It is themed to the Caribbean, with beaches, palm trees, and Latin and reggae music, and it also includes shops and restaurants. King Khajuna – Europe's tallest free fall slide of 31 metres and 55 degree descent by ProSlide. Opened in 2013. Ciclón Tropical – MultiBUMP slide by ProSlide. Opened in 2013. Rapid Race – Pro racer opened in 2013 by ProSlide. The Mambo and Limbo – Two corkscrew water slide by ProSlide. Opened in 2002. El Tifón – Two typhoon Water Slide by ProSlide. Opened in 2002. El Río Loco – Lazy River. Opened in 2002. El Torrente – A 4 passenger tube by ProSlide. Opened in 2002. Barracudas – A pair of 2 Passenger tube sails through tunnels and spins at full speed by ProSlide. Opened in 2002. Zona Indoor with Junior Slides – Indoor play area including pool and slides by WhiteWater West. Opened in 2002. La Laguna de Woody – Woody Woodpecker-themed play area by WhiteWater West. Opened in 2002. PortAventura Hotel PortAventura: Mediterranean theme (4*). PortAventura Hotel Caribe: Caribbean theme (4*). PortAventura Hotel El Paso: Mexican theme (4*). PortAventura Hotel Gold River: Far West theme (4*). PortAventura Hotel Colorado Creek: Far West theme (4*). PortAventura Hotel Mansión de Lucy: Victorian-style Far West theme (5*). During seasonal events like summer nights, Halloween (September–November) and Christmas (November–January), PortAventura Park opens seasonal walkaround rides or shows, including the mazes: [REC], Horror in Penitence, La Selva del Miedo and the nighttime Halloween show Horror en el Lago. Dance Revolution – At the Gran Teatro Imperial Theatre. PortAventura Parade – A parade with music and choreography, leading up to the start of the FiestAventura show. FiestAventura – The fireworks show including water effects and floats. That's clausure the day. Halloween Kingdom – At the Gran Teatro Imperial Theatre. [REC] Experience – Passage of terror. Horror in Penitence – Passage of terror. La Selva del Miedo – Passage of terror. Halloween Parade – A parade with music and choreography of the most terrorific monsters at the park, leading up to the start of the Horror en el Lago show. Horror en el Lago – The fireworks show including water effects and floats. That's clausure the day. PortAventura Christmas World – At the Gran Teatro Imperial Theatre. Christmas Family Festival – A family area only for Christmas. Christmas Parade – A parade with music and choreography full of christmas lights an christmas carriages, leading up to the start of the La llegada de los Emisarios Reales. La llegada de los Emisarios Reales – The Three Kings helpers arrive at the lake with a great multimedia firework show. ^ "Universal Mediterránea destinado a ser el destino familiar más importante de Europa". parquestematicos.org. 13 June 2002. Retrieved 31 October 2018. ^ a b "Corporate responsibility report 2017" (PDF). investindustrial.com. 2018. Retrieved 3 November 2018. ^ a b "Annual report Corporate responsibility 2012" (PDF). fundacioportaventura.org. 2013. Retrieved 3 November 2018. ^ Themed Entertainment Association; Economics Research Associates (2013). "Global attractions attendance report" (PDF). AECOM. Retrieved 3 November 2018. ^ "How to get to PortAventura". portaventura.co.uk. Retrieved 17 February 2015. ^ Richard Schweid (2 November 1992). "Europe's Second Theme Park Planned in Spain". AP news Archive. Associated Press. Retrieved 5 May 2017. ^ "Naissance de Port Aventura, gigantesque parc de loisirs près de Barcelone". liberation.fr. 24 April 1995. Retrieved 28 October 2018. .
^ "Ray Barratt". blooloop. 30 August 2013. Archived from the original on 9 November 2013. Retrieved 28 April 2016. ^ Josep Maria Cortes, Manel Perez (29 January 1993). "La Generalitat tomará y el 10% del parque de Salou si Busch recupera la mayoría". elpais.com. Retrieved 28 October 2018. .
^ Salvador Anton Clavé (16 April 2007). The Global Theme Park Industry. CABI. p. 131. ISBN 978-1845932084. ^ "Pearson raises pounds 58m on sale of Spanish theme park stake". independent.co.uk. 23 June 1998. Retrieved 28 October 2018. ^ "Pearson Completes Tussauds Group Disposal". pearson.com. 19 October 1998. Retrieved 18 October 2018. .
^ "Veremonte y La Caixa se alían en Barcelona World". La Vanguardia. 9 July 2012. Retrieved 26 July 2018. Translation: "Veremonte and La Caixa team up in Barcelona World". ^ "Universal Mediterranea near completion". leisureopportunities.co.uk. 26 February 2002. Retrieved 3 November 2018. ^ "Del Dragon Khan al mayor polo turístico del Mediterráneo". diaridetarragona.com. Retrieved 10 July 2017. ^ "U sells Port Aventura stake". variety.com. 20 June 2004. Retrieved 28 October 2018. .
^ "Spain: Port Aventura, registered 3, 310, 000 visitors, representing a decrease of 8% over the previous year". blooloop.com. 26 February 2010. Retrieved 3 November 2018. ^ "KKR picks up 49.9% stake in PortAventura from Investindustrial | AltAssets Private Equity News". Altassets.net. 6 December 2013. Retrieved 28 April 2016. ^ Joe Kleiman (26 January 2016). "PortAventura Rebrands with New Website in Anticipation of Ferrari Land". inparkmagazine.com. Retrieved 3 November 2018. ^ "Ferrari Land estará separado de PortAventura y creará 150 empleos". La Vanguardia. 7 May 2015. Retrieved 2 July 2015. ^ "Corporate responsibility report '16" (PDF). investindustrial.com. 2017. Retrieved 3 November 2018. ^ "Annual report 2013 Corporate responsibility" (PDF). fundacioportaventura.org. 2014. Retrieved 3 November 2018. ^ Clara Blanchar. "Port Aventura invertirá 100 millones en un nuevo parque dedicado a Ferrari". El País. Retrieved 13 March 2014. ^ Michelle Chenery (2 November 2015). "PortAventura – a world class and versatile events option". incentivetravel.co.uk. Retrieved 3 November 2018. ^ Ashifa Kassam (13 March 2014). "Ferrari theme park to open at PortAventura resort near Barcelona". The Guardian. Retrieved 3 November 2018. 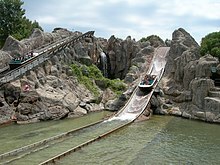 Wikimedia Commons has media related to PortAventura World. This page was last edited on 13 April 2019, at 14:06 (UTC).